At the Pizzacraft headquarters in Berkeley, we’ve tried just about every possible way to cook a pizza, searching to beat our personal bests. From tinkering with pizza steels under a broiler, to a frozen pizza smoked and cooked on the grill, we’ve learned a lot about pie cookery. We wanted to share our findings with everyone to help you step up your home pizza game, so here are a few things you can do to take your pizza game to the next level. These days there are quite a few options on how to cook your pizza at home. Upgrading your equipment doesn’t have to mean thousands of dollars on a wood fired oven anymore. Our Pizzeria Pronto oven is a great home solution for the pizza fanatic. If you’re not quite ready to buy your own pizza oven, consider a pizza stone or pizza steel. While these two products aren’t quite as quick as a propane-powered pizza oven, they still allow you to ditch your old-school pizza pan and improve your pizza. A good stone or steel setup with a sturdy pizza peel will put you leaps and bounds ahead of your rusty old cookie sheet. The perfect dough takes a bit of practice to become second nature. While there are plenty of dough recipes out there, covering many different styles, it’s still hard to put into words how to make outstanding dough. My best advice is to find a good recipe, and stick to it, exactly. Baking is different than cooking; it’s much more of an exact science where small mistakes can mean big consequences. If it says mix for 6 minutes, don’t mix for 8, don’t mix for 5… mix for 6! The best recipes call for proper resting times while mixing, and encourage you to judge your dough by consistency, not solely by quantity of ingredients. Also, use filtered water in your dough recipe to avoid potentially killing the yeast. With pizza, as with many other foods, there are some average quality ingredients that you can get by with. Of course, the dough needs to be good, so don’t skimp when buying flour or yeast. While it's not necessary to buy imported fine grind Italian flour, you should still buy a respectable brand of either all-purpose or bread flour. You might be able to skate by with some pre-made pizza sauce, but when it comes to cheese, don’t take shortcuts! Buy your cheese whole, not pre-shredded, and preferably a respectable brand. When you buy pre-shredded generic cheese you’ll be getting anti-caking agents and whole slew of other additives that are less than desirable. 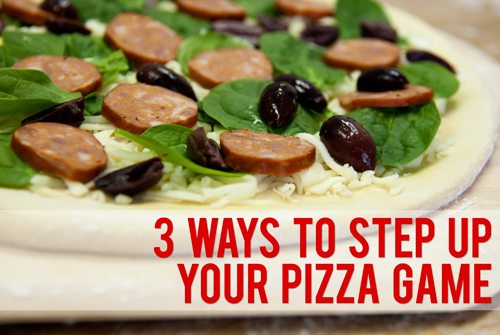 Unlike dough, when it comes to toppings don’t feel like you have to follow the recipe exactly! If you don’t like onions and a recipe calls for them, change them out for your favorite vegetable. You may find that some toppings work really well together, and some don’t… but in the end it’s all about finding your favorite pizza combinations. Over the years I’ve found that “less is more” with pizza. Pies don’t have to be piled high with toppings to be great! Upgrading your pizza arsenal, perfecting your dough method, and buying only the freshest ingredients will take your pizza game over the top! What have you done to upgrade your pizza making skills?